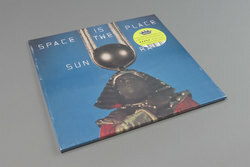 Sun Ra - Space Is The Place. Vinyl LP. Bleep. All time classic from the Ra and his arkestra. Described as one of the mythical jazz mavericks most accessible works, Space is the Place positively glows with the chaotic atmosphere of early 70s jazz cafes and bohemian reckless abandon. The wailing tones of ‘Images’ marks a high point on the album, but even listening to the pieces again after being familiar with them for years now still manages to take us back to some faraway land. If you aren’t already acquainted then you’re in for a treat. One for the cosmonauts!